I never knew pineapple peels would pack in so much flavors. 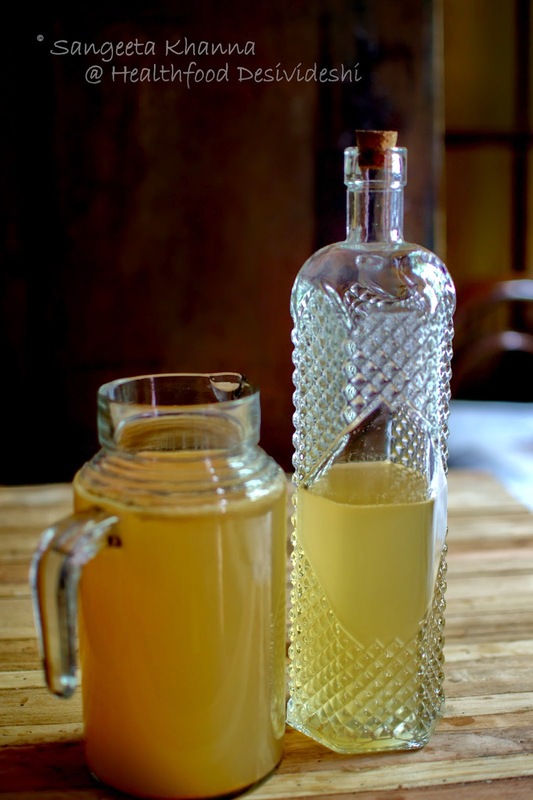 I have been experimenting with fermented drinks and salads for ever. Having worked in a microbiology lab keeps the fire ignited all the time, the friendly microbes are always close to heart. I started experimenting with this pineapple kanji 2 years ago when a few carrots were dug out from the garden and those were too fibrous to eat. I usually would soak them in water and required spices to make the kanji but that particular day I was peeling a large ripe pineapple for my salads. It used to be a pain to see so much of juicy bits of pineapple flesh being wasted along with the tough spiny skin. I did an experiment that day. The pineapple was cleaned before peeling with a soft brush under running water to clean everything from the rough skin. Then it was peeled as I would do so normally. All the peels and small bits that come with the 'eyes' were thrown into the kanji jar along with the 2 fibrous carrots. 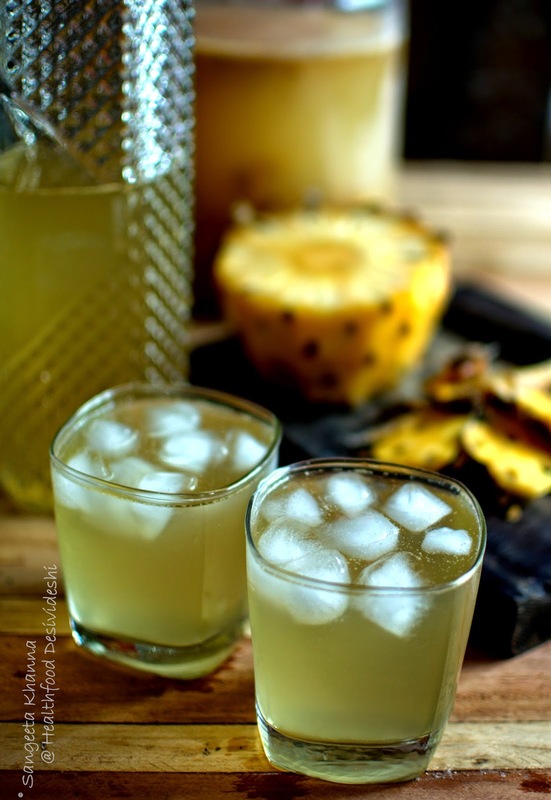 A wonderfully refreshing drink was ready after a week and I was amazed at how much flavors the pineapple skin still retained. Later I started making kanji with just the pineapple peels and pith. The carrots were skipped conveniently. After all carrot kanji is a different thing to enjoy on it's own. Actually the skin and the pith of the pineapple is quite rich in Bromelain, the digestive enzyme that helps digest dense proteins easily and the vitamin C and Manganese content of the fruit is very high hence the anti oxidant property of this fruit. Manganese helps absorb and utilise many other nutrients and it makes pineapple one of the healthiest foods. So when we enjoy all this goodness in the edible flesh of the fruit, why should we waste such nutrients that we can harvest from the peel and pith as well? The last batch of my pineapple kanji was ready today, ready to be strained and a bottle of 2 month old kanji was still lying around. 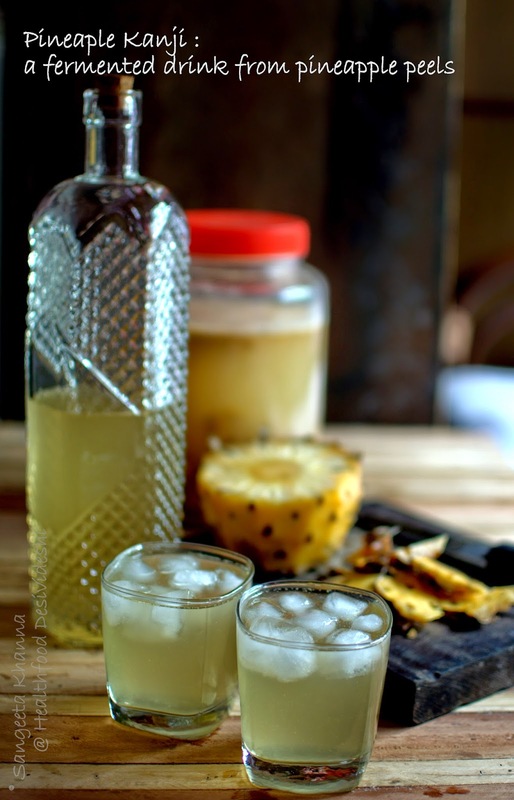 You would be surprised to know this pineapple kanji is stable at room temperature once it is fermented well. Just add ice cubes in summers and have at room temperature in winters. It is a refreshing drink that you can have one glass everyday. Add soda to it and it becomes tingling smacking good. Here is the bottle of 2 months old kanji, a freshly fermented pineapple kanji ready to be strained and a pineapple being peeled, it's fresh peel and pith ready to make another batch. No I am not mad, I just love what I do. This is the 2 months old pineapple kanji with ice cubes. The contents of the fermenting jar are strained to discard all the peel now that we have extracted out flavors from it. The kanji has a really kicking taste of pineapples and the tangy taste of the usual kanji owing to mustard seeds and red chilly powder.. I added 2 liters of filtered water, 2 tsp of mustard seeds, 1 tsp red chilly powder and 1 tbsp table salt. 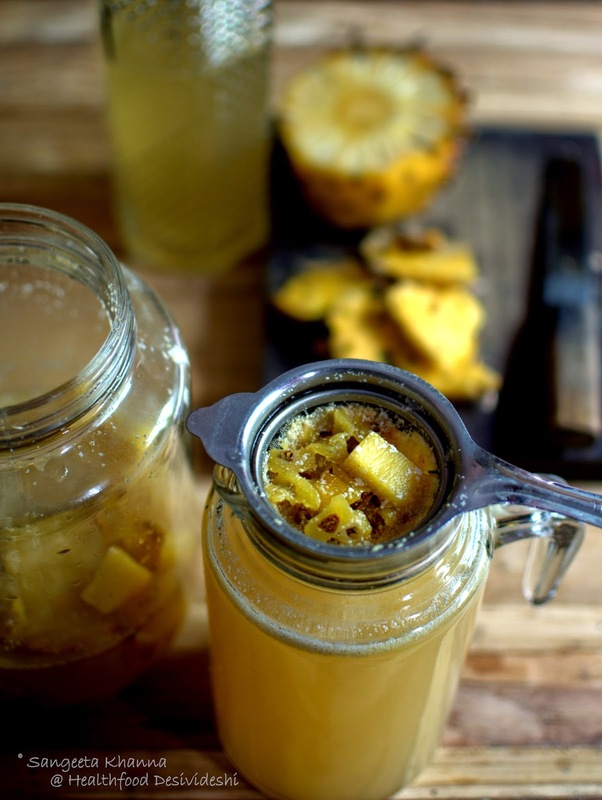 Peels and pith of half a pineapple went into this jar. This is a simple recipe to be followed. Keep this mix into a lidded jar and let it ferment for 5-7 days. This jar can be kept at your windowsill or on the highest loft of your pantry where some ambient light reaches. I have never tried fermenting it in dark but there shouldn't be a problem if you keep the jar in a dark pantry as well. The amount of mustard added is lesser than kaali gajar ki kanji just because the pungency of mustard would kill the refreshing taste and aroma of pineapples. Mustard seeds initiate fermentation and once the culture has set in, starting form the ambient mix of yeast strains, the culture keeps growing till the fermenting mix is stable. Red chilly provides ambient lactobaccili and a few more mesophilic bacteria for sure. I am not sure what would be the percentage of acetic acid, alcohol and aldehydes in this drink, as I never tested it, but the drink is stable at room temperature unlike carrot kanji that keeps getting more sour at room temperature and has to be refrigerated for longer use. 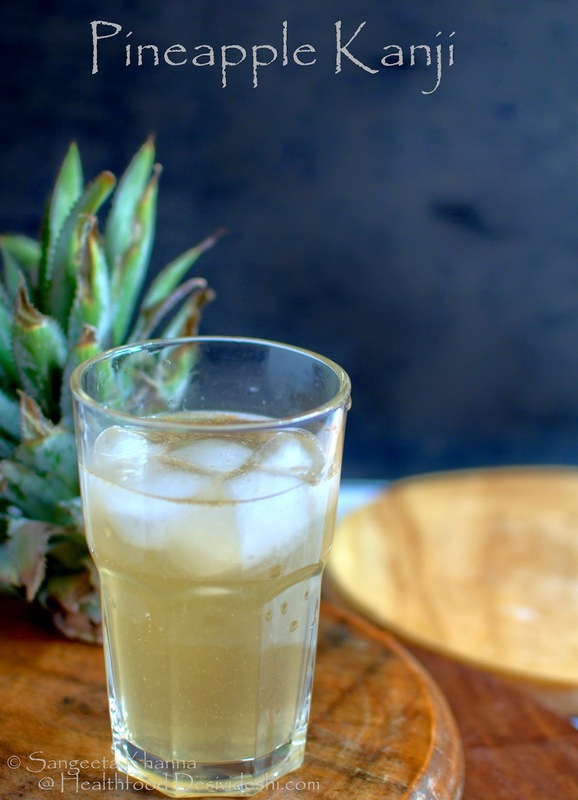 May be the Bromelaine or a high amount of ascorbic acid present in pineapple helps stabilise the drink but it is a great result for kanji lovers for sure. Also, keeping the strained liquid for a week or so clears the turbidity and a crystal clear drink is yours to relish. See how the jug has a turbid liquid (the freshly strained kanji) and the bottle has crystal clear drink that looks gorgeous. Read more about benefits of fermented foods here. Please note that Kanji is wrongly judged as an 'acquired taste' (indicating it is foul smelling and weird tasting), but if your kanji is smelling foul it means the culture has become contaminated. Discard the kanji or kanji culture if it tastes foul. A thin white layer of mould will be seen on the fermenting kanji, just keep mixing it so no new strains of contaminants get a chance to grow in the same culture. This kanji has strong overtones of pineapple, sourness of the fermented sugars and a hint of sharp heat provided by chilly and mustard. A very intriguing mix of flavors in fact. Ask me questions if you want to ferment your own kanji and something makes you feel nervous. I wish I could make you smell and taste this drink now. I made this kanji with peels of watermelon as well, the white pith was used, the green skin was discarded. The drink was tasty and sour as a kanji should be, but not as refreshing and aromatic as this pineapple kanji, neither as colorful as kali gajar ki kanji. But the watermelon rinds become a nice pickle after you make the kanji. So if you like pickled carrots or watermelon peels you can make the kanji with those as well. For me, pineapple kanji is a winner and I don't bother making watermelon peel kanji anymore. Hi Sangeeta, I have never had kanji, but this looks gorgeous! Sangeeta, ur kanji recipes surprise me. In tamil nadu cuisine, we make rasam with pine apples and in karnataka cuisine gojju. Both are very tasty and while making them, i used to sadly discard the peels, then i whenever i make a gojju, i make the rasam with the peels and discard them while serving, Will chare the recipe of both, if u wish. Please do share your recipes Nirupama. We all would be benefited here. Thank you so much. Interesting! !Will definitely give it a shot!! 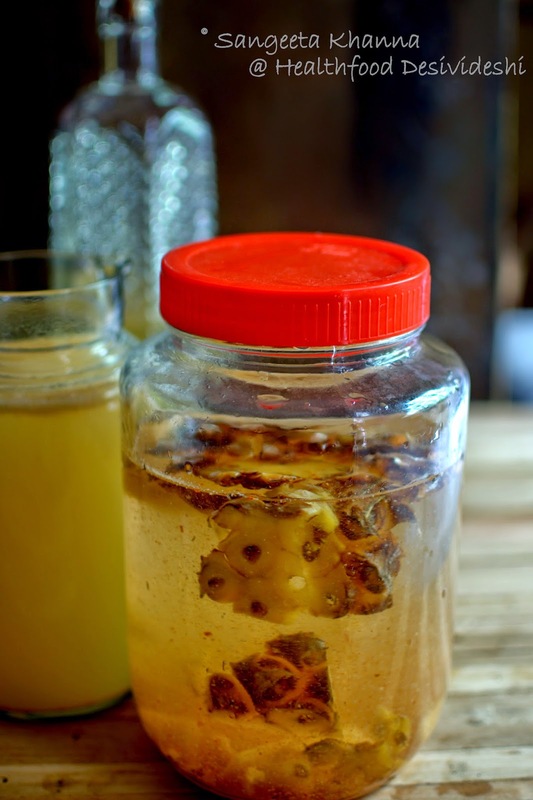 This pinepalle version sounds so exotic and refreshing and since you seem to be a master at fermenting... I have a question.. I have about 3 glasses of my winter staple kaali gajar kanji lying around...am scared it mightve gone bad..tell me how do I find out if it is edible or not? and thanks for sharing this wonderful wonderful recipe.. Thanks Reeta. For the leftover kaali gajar ki kanji, just do a smell and taste test on it, if it doesn't smell foul it means it hasn't got contaminated. In most probability it has become a vinegar by now...taste a tsp of it and you would know it. You can use ot for salad dressings or for tenderising meats in that case. Hope it helps. Ahhaaa...was waiting for your recipe..pineapple in this version looks and sounds so refreshing!We used to add orange and lemon peels in the normal kale gajar ki kanji...but pineapple into this is amazing. Heat oil in a kadai and addroast the following., , 1/2 tsp methi, 1 tbsp sesame, 1/2 tsp jeera, 1 tsp urad dal, 1 tsp chana dal, 4 to 5 red chillies and 4 to 5 tbasp grated coconut. roast the coconut at the end and grind everything to a smooth paste. In another pan heat some oil, add mustard, curry leaves and hing, add 1 cup of chopped pine apple and saute over alow flame for few min. add tamarind paste or water and allow it to boil for 2 mts after adding salt, once the pine apple is cooked(the slight crunchy texture preferred) add the ground paste , and 1 tbsp of powdered jaggery allow it to boil for a few minutes and switch off the flame,. There will be more bottles of kanji happening this end too, and with every sip I will thank you. I could have never imagined something like this was possible. I am thrilled!! Thank you! Awesome, Sangeeta! I am itching to try this out. First I have to go and buy a pineapple. I love kanji but have never ventured beyond the gajar variety! Can we all a little black salt here to enhance the taste? I add black salt to my pineapple slices too. Do try this Rachna. Kala namak can be added after tasting the ready kanji or at the time of serving as well. The salts in kala namak may interfere with the fermentation process I feel, if you are adding it to start the culture. Thanks for that tip. I will let you know how it turns out :). OMG ! U can start retailing this ! what an experiment ?! Hats off to you . When ever I ll make this I ll surely let u know . Hi, do the mustard seeds need to be powdered or used whole? Also would any mustard seeds do (yellow & black) as well as the small raidana? Thank you in advance and this is an awesome page! Any mustard would be good if you like the taste. Use coarsely powdered mustard. 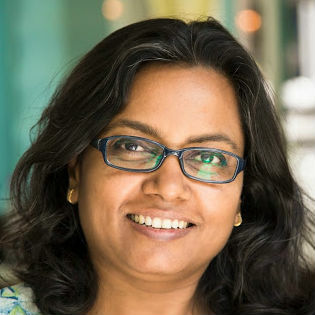 Hi Sangeeta. I just tried my first batch pineapple kanji. I used mustard powder and sea salt. No sugar. I hope that this turns out good since I love pineapple drink. 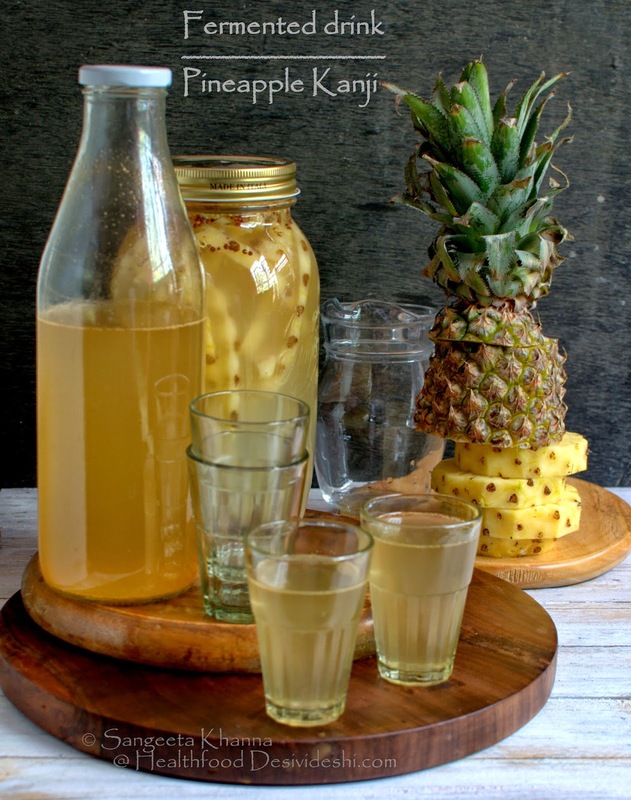 Where I come from we make pineapple drink with sugar, a little bit of citric acid of freshly squeezed lemon juice and let it ferment for two weeks. That is so good and very refreshing as well. I am very curious how this will turn out. Thanks for the recipe. Your version sounds really good too, will try myself as I feel it will have a nice citrus tang. This version with mustard will be have a bit if kick in it. Can be used directly for salad dressings too. I live in a colder area with not too much sunlight. If I leave the kanji by the window will it still ferment? The inside temperature is about 70 degrees fahrenheit. It doesn't need sunlight to ferment but a warm place. You can keep it close to an oven or a warm place in your kitchen. At 70F it will take a little longer to ferment may be. 1) does this ferment in a closed or open jar (before straining and bottling). 2) I'm confused about your comment about the thin white layer of mould growing on top while fermenting, and to keep stirring it up so that no new contaminants can take hold. Do you mean that mold will grow on top in a healthy ferment or when it's gone bad? And should we stir daily for the 5-7 day ferment? 1) closed jar is okay since we open it 4-5 times for stirring the surface. 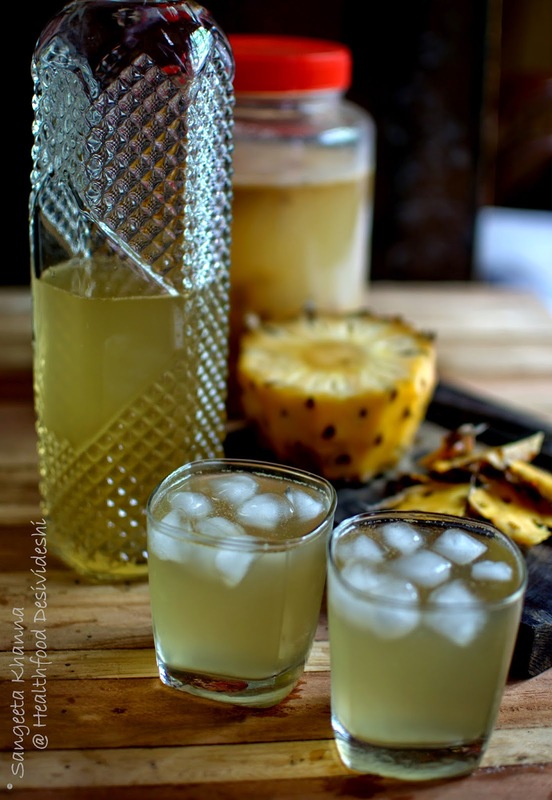 2)This is because the pineapple peel keeps floating in the water and can attract contaminants. W just push the peels down so it is always wet with the fermenting mix. I hope it answers your question. 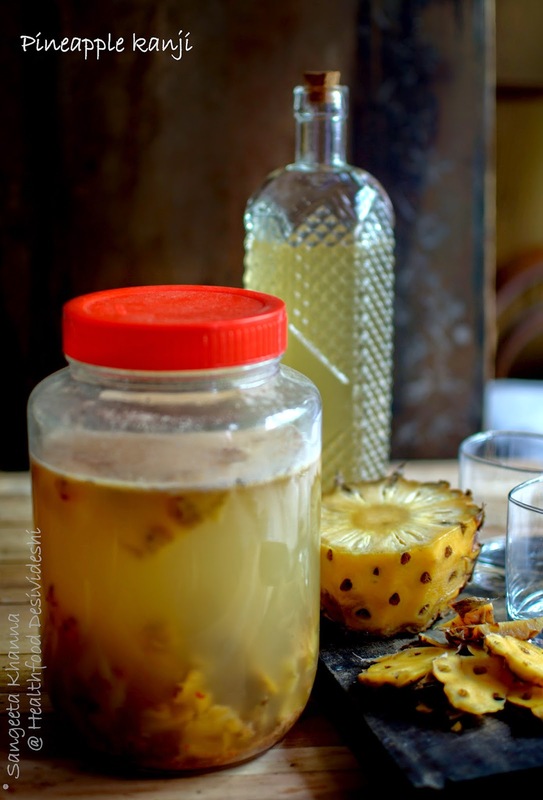 Waiting for your feedback after you make this pineapple ferment.